I don’t think you need a translator to realize that this says Agnes is marvelous. For quite a while now, it has been an Integrity Toy’s WClub custom to offer up an “event doll” made available to members when they hold a webinar. It’s a nice little perk for members and it’s always in addition to the club dolls offered up as part of the WClub membership. You get the right to purchase this doll just for being a WClub member. Many collectors take advantage of this deal. The doll offered up for this years 2017 Nu.Face and Fashion Royalty collections was very special. Designed by Jessy Ayala again and according to his explanation was inspired by one of his favorite designers. Well hello Ms Carolina Herrera!! Could this doll be any more exquisite… I ask you? This clutch?!!! This Clutch!!! I adore this entire ensemble from tips of toes to top of head. 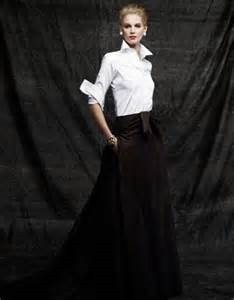 Carolina Herrera is known for her standard attire of crisp white shirt and black skirt. This doll is only available to WClub members. This entry was posted on June 26, 2017 by raberry65. It was filed under Agnes, Fashion Royalty and was tagged with 1/6 doll, Agnes, doll collecting, fashion doll collecting, Fashion Royalty, Fashion Royalty 2017, Integrity Toys 2011, Integrity Toys 2017, Jessy Ayala, La Femme Fashion Royalty Collection, Merveilleuse Agnes Von Weiss™. Loving Agnes’ return to being a woman of the world with her meticulous grooming and styling ! !